The wastewater treatment plant studied is located in Manresa, a town of 100,000 inhabitants, located near barcelona (Catalonia). The plant treats a flow of 35,000 m3 day mainly domestic waste water although waste water from industries located inside town are received in the plant too. 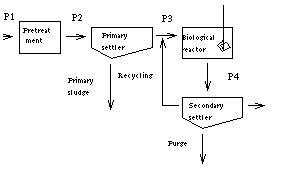 Initially the experts provided a set of 38 variables, 8 of which are quality indicators, that are measured in several places of the plant (at the input (P1), after the pretreatment (P2), at the input of the biological reactor (P3) and at the water output of the plant (P4)) with a daily frequency, 9 of which are percentages of performance. In this study the behavior of the plant along 527 days has been considered. The dataset was originally recorded to be used with the K-means algorithm [Sànchez96] and its adaptation to be used with LINNEO+ [Béjar95] did not caused extra work to the expert and not data engineering was done. The dataset is available by anonymous ftp from the UCI Repository of Machine Learning Databases and Domain Theories (ftp.ics.uci.edu). J. Béjar,Adquisición de conocimiento en dominios poco estructurados PhD thesis, Departament de Llenguatges i Sistemes Informàtics. Facultat d'Informatica de Barcelona. Universitat Politecnica de Catalunya, 1995. M. Sànchez-Marrè, U. Cortés, I. R.-Roda, M. Poch, and J. Lafuente, "Learning and adaptation in WWTP though Case-Based reasoning". Accepted in special issue on Machine Learning of Microcomputers in Civil Engineering. June 1996. M. Sànchez-Marrè, U. Cortés, J. Béjar, J. De Gràcia, J. Lafuente and M. Poch, "Concept Formation in WWTP by means of Classification Techniques: a Compared Study" . To appear in Applied Intelligence 7(2), 1998. Accepted in December, 1995. M. Sànchez-Marrè, U. Cortés, J. Lafuente, I. R.-Roda, and M. Poch, "Knowledge-based techniques in wastewater treatment plants managment". Submitted to Enciclopedia of Life Support Systems (EOLSS). September, 1995.